A pair of interesting auteurs debuted films this weekend in the U.S. Dramatic Competition portion of the Sundance Film Festival 2018, and they were two of my most anticipated films coming into this year’s celebration of independent cinema. Reed Morano and Sebastian Silva always bring something interesting to the table—Morano with her striking visual sensibility borne from her remarkable skill as a cinematographer and Silva with his storytelling verve that makes everything he does unpredictable (after the turn his 2015 Sundance film “Nasty Baby” took, one can never take for granted they know where his films are going ever again). Sadly, neither film worked for me, even if I’m still eager to see what these filmmakers do next. The more rewarding of the two films, purely for its visual language, is Morano’s “I Think We’re Alone Now,” which was directed and lensed by the on-the-rise filmmaker who won an Emmy last year for Hulu’s “The Handmaid’s Tale.” It’s impossible not to wonder if that experience didn’t color her approach to this production as it also details a dangerous and confusing future. Morano’s visual acumen is on full display, and the film’s sound design is undeniably accomplished, but the script here by Mike Makowsky gives its characters absolutely no room to breathe, turning it into an airless exercise in pretty pictures that amount to far too little in the end. The great Peter Dinklage stars as Del, an employee of a library in a small town in upstate New York. He’s also the only person left in the world. Without any explanation as to why everyone else is dead or why Del is not, the film drops us right into Del’s bizarre daily life as something of a human WALL-E. He spends his days in silence, going through the town house by house to clean them out. He removes the bodies, buries them, and takes anything that can help him, particularly batteries as there’s no power otherwise. Why bother with the bodies or cleaning out the refrigerators? Del clearly likes a sense of order, and even without dialogue it seems like he has developed something of a comfortable routine. He eats the fishes he catches in a nearby lake, reads books, drinks wine, and watches old movies on laptops he finds in his daily housecleaning. And then Grace (Elle Fanning) shows up. Grace is the extrovert to Del’s introvert. He immediately tells her to leave, realizing he’d be happier alone, but he gives in to her pleas to stay. She opens Del up a bit, and Makowksy carefully draws the differences between the last two people on Earth. In one of the best-written scenes, Grace details how much she lost when the world basically ended. There’s an interesting subtext to the idea that Del was always alone, the kind of guy that no one noticed even when the planet was populated, but Grace was not. However, it’s also clear that Grace has some secrets, and the final act pivots tonally to reveal them. Some will love the twisty ending. For me, it took a film already wobbling on the edge and sent it careening. The bigger problem is that “I Think We’re Alone Now” is one of those films that imagines the apocalypse would also kill almost all humor and heat. It’s somewhat laudable that Grace and Del don’t instantly fall in love, but there’s a self-consciousness to the storytelling here that too often keeps these characters in a pretty bubble when they needed to be relatable to be resonant. The film’s best scenes are the ones in which Grace is allowed to behave in a way that feels joyously human—headbanging in Del’s car or playing with a stray dog she finds and brings home. But too often, “I Think We’re Alone Now” feels like an undercooked metaphor, which then loses most of its power with what could be called a twist ending. When it was over, I felt cheated by a film that should be about relatable issues like loneliness and difficult connections between different personality types but never lets viewers into its world in a way that feels organic or enjoyable—choosing to go for a jaw-dropper instead of developing its themes. The film’s best visual comes early as Del sees a fireworks display in a world that should be empty. I’m just disappointed that the film never really matches those unexpected fireworks again in its storytelling. A similar frustration at unfulfilled potential sunk into me as I was watching Sebastian Silva’s “Tyrel,” a genre hybrid that the filmmaker reportedly made after a project with Will Ferrell fell apart at the last minute. 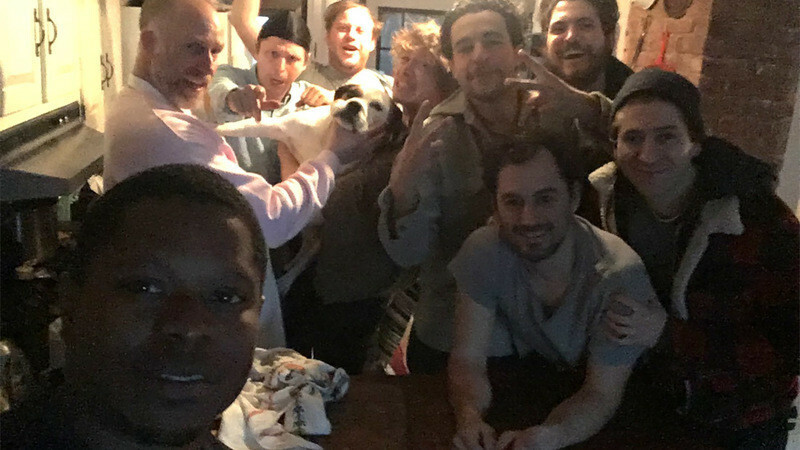 Silva got his buddies together, including regular collaborator Michael Cera, and they went to a home in the Catskills to make this undeniably unique tale of a weekend of drunken male debauchery, set on the weekend of Donald Trump’s inauguration. The result is a film with a very off-the-cuff energy designed to make people uneasy but that doesn’t amount to nearly enough in the end, and that’s constantly hampered by shaky, handheld, barely-focused camerawork that’s meant to increase tension but merely kept reminding me I was watching a barely-there movie. The great Jason Mitchell (“Mudbound”) stars as Tyler (someone mistakenly calls him Tyrel in an early scene if you’re wondering if I just got his character’s name wrong), who goes to a weekend party with his buddy Jonathan (Christopher Abbott), mostly to get away from his family for a few days. It’s clear from the early-going that Tyler is the odd man out in a party of Jonathan’s friends, all of whom happen to be white. Early in the film, Silva plants the seeds of racial tension in a scene in which the gang plays a game in which they have to mimic accents and someone draws “black voice.” But Tyler lets it slide with relative ease and it’s more of an undercurrent that he’s the only black guy there than anything that feels like danger. These guys who sing R.E.M. songs and make hot toddies seem more annoying than harmful, although the fact that Tyler is reading The Lord of the Flies is almost too ominous. “Tyrel” achieves its greatest momentum as Tyler gives up on actually getting along with people with whom he has very little in common and starts drinking heavily. Most of us have been to parties where the booze flows a little too freely, and Silva uses that to amplify the tension, especially when a machete comes out for a little game involving a Trump doll and a blindfold. The problem is that tension is about all there is to “Tyrel.” It’s a film designed to keep you on edge—and there’s something to that in terms of a filmmaking exercise—but the racial underpinnings as well as the veiled commentary on the uneasiness that came with our 45th President feel woefully underdeveloped. It’s a movie that formally wants you to feel as tense and half-drunk as Tyler, layering loud, sometimes incoherent dialogue on top of each other in a way that makes the party often feel more annoying than enjoyable. Visually, cinematographer Alexis Zabe (“The Florida Project”) films everything like he’s had a few himself—rocking his camera back and forth, focusing in extreme close-up—it’s a choice I trust was designed to intensify Tyler’s increasing frustration, but merely pulled me out of it with its assaultive style. Ultimately, despite some believable, lived-in performances (Mitchell is particularly great, again), “Tyrel” is a film that you keep wishing will come together into something greater, but never quite does, making it just the story of a weekend spent with some really, really drunk dudes in the Catskills. I could do that in my free time.